If I were a lawyer I’d bill 80 hour weeks every week of the year. Why am I not totally burned out, dead on arrival? Because a lot of what you consider life I think of as my job. I don’t distinguish between work and life. Going for a workout? That’s work. Going for a bike ride? That’s work. Coffee with someone? That’s work. Reading a book? That’s work. Dinner with someone I haven’t met? Most of the time that’s work too. I don’t artificially divide my time between work and non-work. We have one life. When you sell yourself to someone between the hours of 9 and 5, you start to think that work time and you time are different. Different rules, different goals. But it’s all the same time. There is only one you. And the only person you work for is yourself. Would you spend your money the same way you spend your time? When you divide the world into work and life, you end up falling into a trap. You stop thinking about how you invest your work time because someone else gets the dividends. You also believe that anything that happens at work is work, no matter how ridiculous and counterproductive it is. Pointless meetings? That’s what we get paid to do. Mindless PowerPoints? That’s part of the job. You stop thinking of work as the place where you produce something valuable and start seeing it as this daily penance that is separate from who you really are. This attitude stops you from getting better. When you sell yourself to someone for regular hours and a paycheck, they want to exploit what you already know to grow profits. They don’t care about you getting better. Sure they pay lip service to growth and learning but it’s BS. You can easily test this: pick up a book and start reading it at your desk and see what happens. I’m guessing it won’t take long for your boss to tell you that’s not work. To the employer, work is productive time. You either have to be busy or look busy. This is what your job becomes. Work is immediate and defined by the amount of meetings in your calendar or the emails in your inbox. No wonder, we’re collectively exhausted at the end of the day. Work didn’t fulfill us, it consumed us. And so we grab a beer and turn on netflix. This is why we don’t get better. We become progressively unengaged with what we do on work time because that time isn’t our time. This is why our jobs are at risk. The only person you really work for is you. Reading to learn something new is getting better. Taking time to think about something is getting better. Anything you do to grow is getting better. Attending meetings that waste your time? That’s not getting better. That’s pointless BS. Projects that have to satisfy 5 contradictory opinions? That’s not improving. That’s lack of direction. Anytime you’re physically present but not mentally present, you’re wasting time. Sure I work all the time, but I’m more careful with my time than anyone I know. I work on getting better, on improving myself and my life. And it means I filter out stuff that isn’t making me better. No I don’t want to meet for coffee. No I don’t want to speak at your event. No I don’t want to come on your podcast. No I likely won’t reply to your email. That stuff gets in the way of growing. Busy is life. But you want to avoid the stuff that isn’t making you better. Sitting around playing games on your phone isn’t making you better either. When you get time to do something for yourself, you need to make it count. When you sell your eight hour day to someone else, you’re not really learning. You’re not improving. You’re driven by one appointment after another. You’re not free to learn. You’re not free to grow. When you think of life as work and non-work, it’s tempting to rationalize that soul-crushing is OK. I don’t distinguish between work and non-work because there is only one life. It’s all supposed to be work in some sense and it’s not supposed to crush your soul. Of course, most of us have bills to pay, so we go to work. But if we let that mentality create a work-life divide it can zap us from getting better. Steal time for yourself to get better whenever you can. Remember at the end of the day you’re working for yourself, even if you’re renting out 8 hours a day to someone else. And the only thing you care about is getting better. 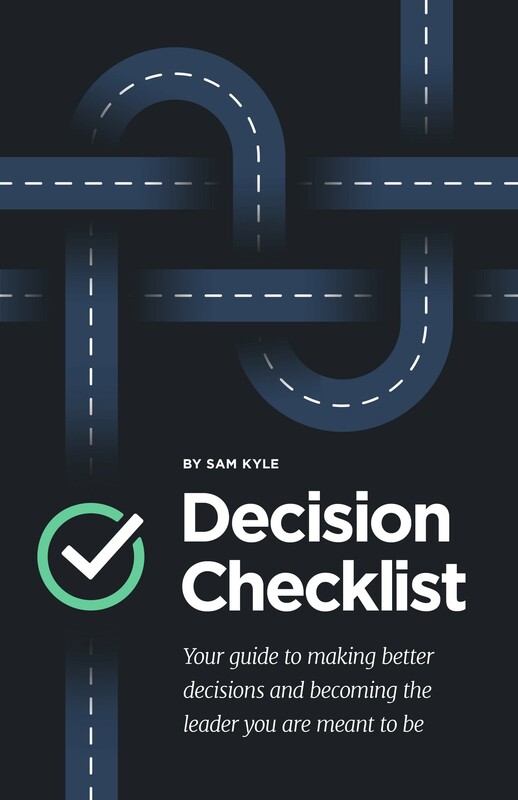 If you like this, check out my book: The Decision Checklist: A Practical Guide to Avoiding Problems.